With Cartes postales de Chimère, Louise Bédard made her mark in the dance world as both a dancer and choreographer, earning rave reviews from critics and audiences alike. In 2015, she remounted the work, passing on her solo role to two reputed dancers—Isabelle Poirier and Lucie Vigneault—in order to further explore the colours and complexities of the piece. The new version of Cartes postales de Chimère reflects Louise Bédard’s desire to transmit Quebec’s contemporary dance heritage and keep it alive in our memory. This solo work requires the dancers to draw on inner resources in order to offer audiences more than just a physical performance. It is a wonderful opportunity to reach further and convey a universal message. 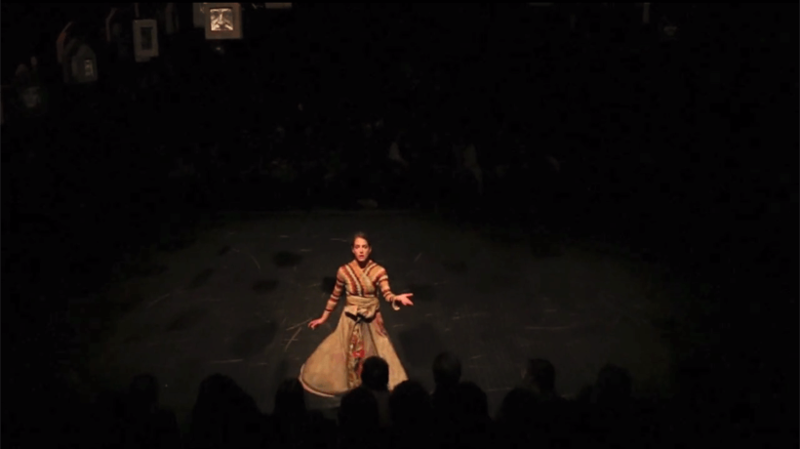 The woman on stage is both alone and accompanied by multiple versions of herself that span different cultures and time periods. In the first part of the performance, she expresses a lightness of spirit set to the music of Brahms. The “weight” of her body then marks out the path of her journey. Her attitude is both playful and down-to-earth. She is committed to speaking with her own voice, through her body. 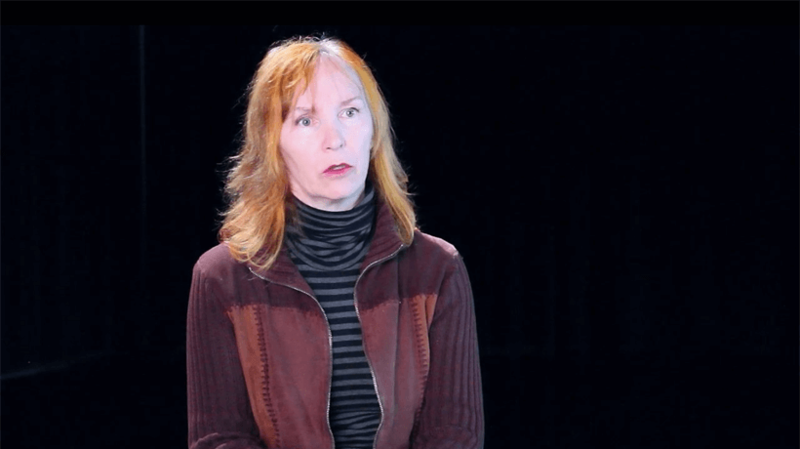 This interview of Louise Bédard, taken in the early Cartes postales de Chimère recovery reversal rehearsals, takes us to the heart of the production. Choreographer with her eyes and her words , makes us discover (again) her work by sharing the workings of creation. 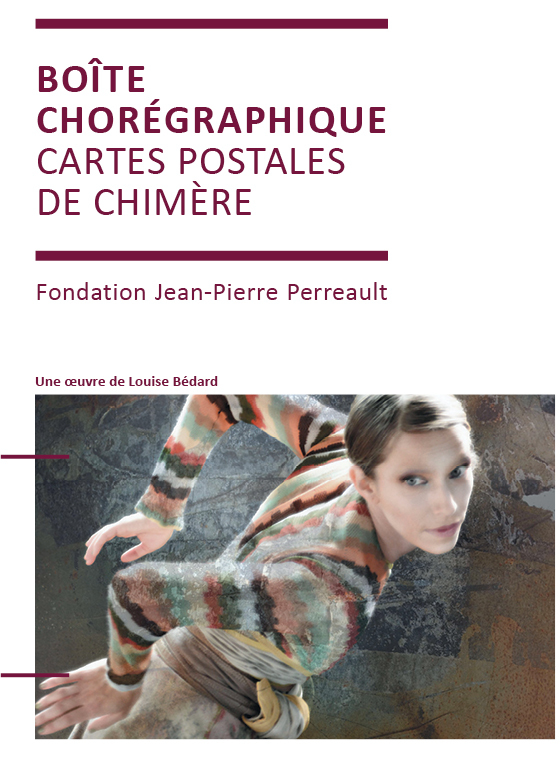 Louise also talks about the content of the choreographic box, such as the choice of dancers and the contribution of each artists, which have contributed to make Cartes postales de Chimère a complete work in dance, designing costumes and accessories, set design, and music. A single figure wanders through time and across different paths to imaginary continents; towards vast and opulent places. Movements emerge, like landmarks along the way; worlds are shaped by mature hands, lands made rich by a child’s eyes. Where are we? Who is she and where are we going? Video during rehearsal with Louise Bédard and the two charismatics dancers : Isabelle Poirier and Lucie Vigneault (2015 restaging-handover). Challenge for Louise is passing both women her solo and her mature knowledge on to dancers who can draw on their own experiences of the solo as it was originally staged, and can interpret it through their own personalities.